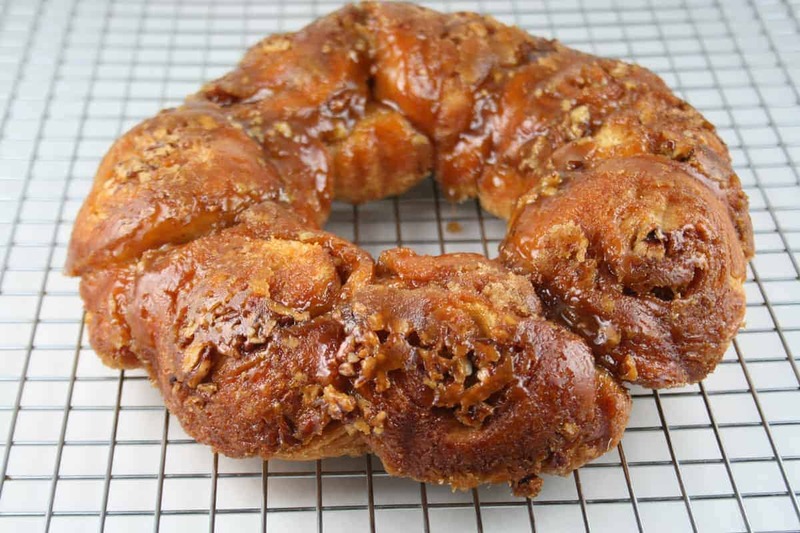 Crescent Caramel Swirl was 1 of 2 winners at the 27th Pillsbury Bake-Off in 1976. Recipe on Pillsbury.com by Lois Ann Groves of Greenwood Village, Colorado. 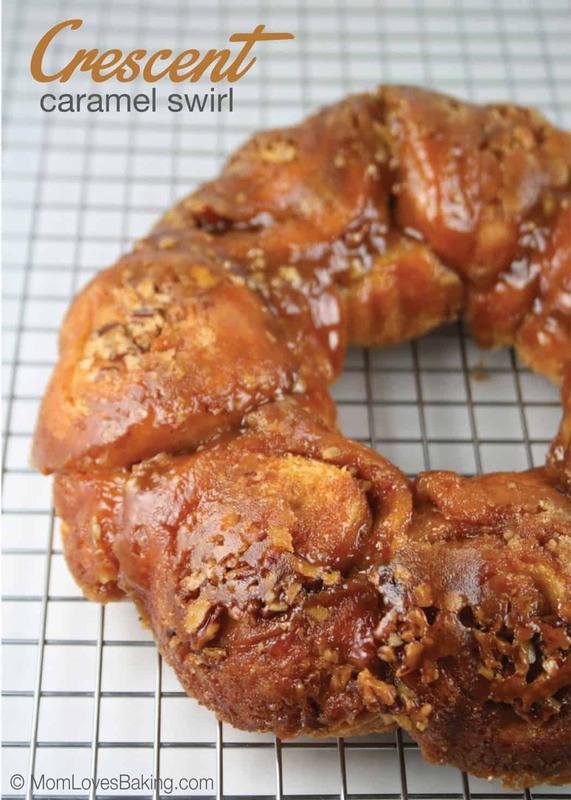 Start by pouring melted butter in a bundt pan and sprinkle with nuts. 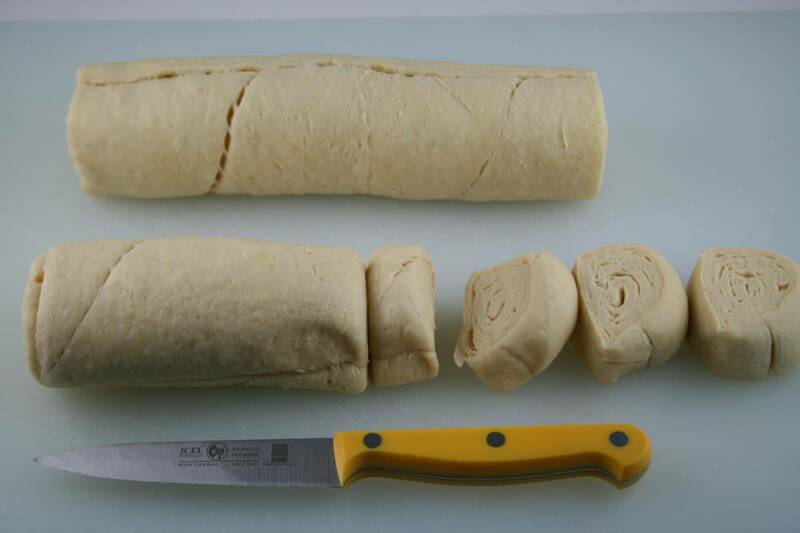 Then cut each roll of crescent dough into 8 pieces as shown in photo. Create your “caramel” by boiling a mixture of butter, brown sugar, nuts and water in a small saucepan. 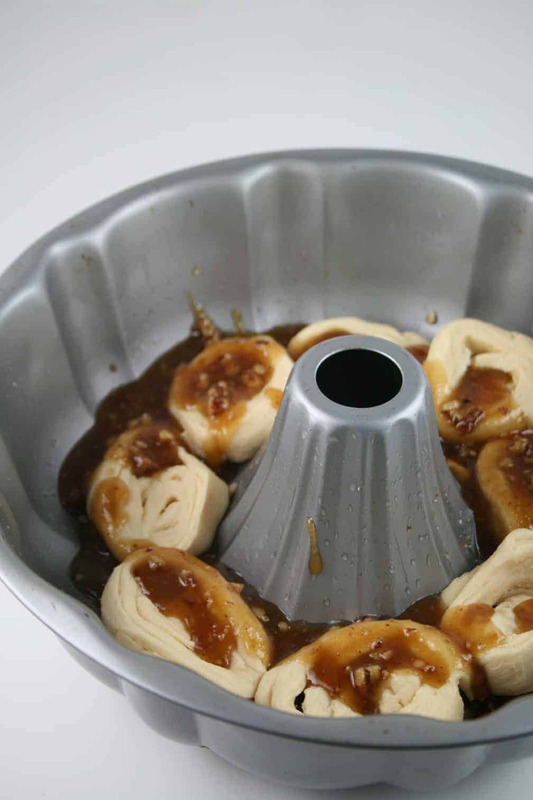 Place 8 dough pieces in prepared bundt pan. Pour half of the caramel over dough. Place remaining dough and caramel on top. Here’s how it looks after baking for about 30 minutes at 350°F. Heat oven to 350°F. In 1-quart saucepan, melt butter. 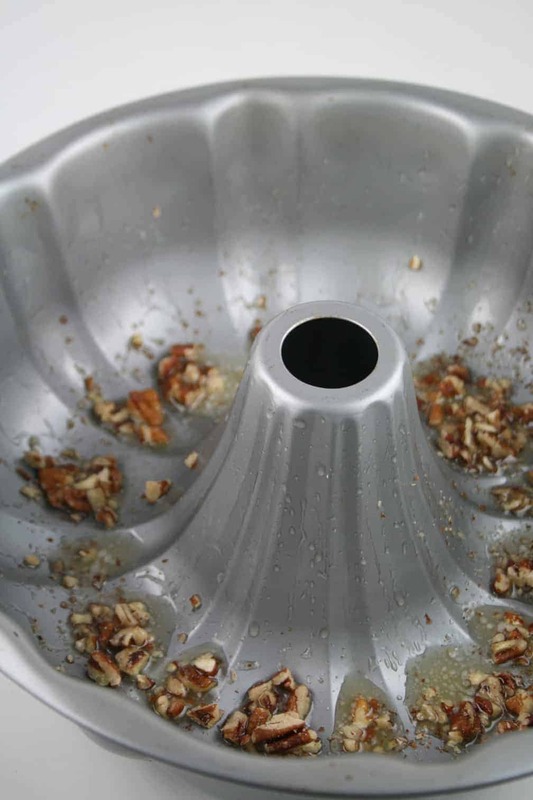 Coat bottom and sides of 12-cup fluted tube cake pan with 2 tablespoons of the melted butter; sprinkle pan with 3 tablespoons of the nuts. Add remaining nuts, brown sugar and water to remaining melted butter. Heat to boiling, stirring occasionally. Boil 1 minute, stirring constantly. Remove dough from cans; do not unroll. Cut each long roll into 8 slices. 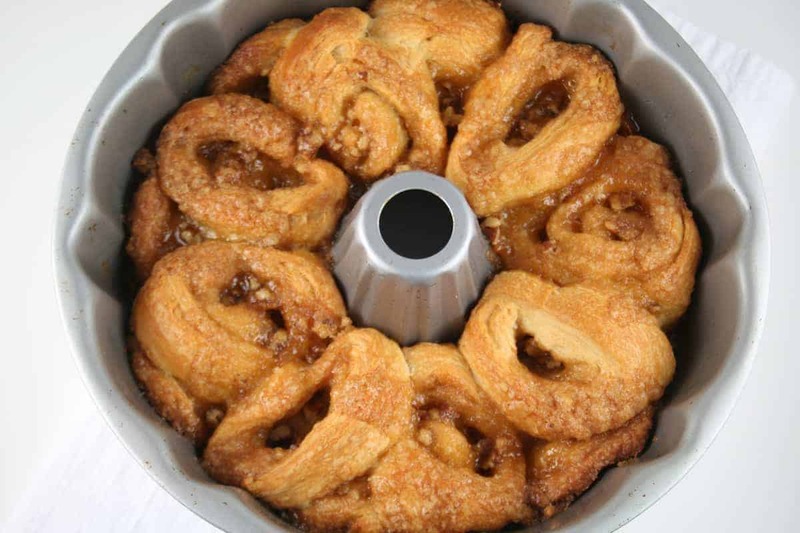 Arrange 8 slices, cut side down, in nut-lined pan; separate layers of each pinwheel slightly. Spoon half of brown sugar mixture over dough. Place remaining 8 dough slices alternately over bottom layer. Spoon remaining brown sugar mixture over slices. Bake 23 to 33 minutes or until deep golden brown. Cool 3 minutes. Turn upside down onto serving platter or waxed paper. Serve warm.